Throughout this year’s presidential campaign, the competitive portion of the electoral map has been limited to about 12 or 13 states. There are the nine that flipped from Republican George W. Bush in 2004 to Democrat Barack Obama in 2008, plus four or so others — Michigan, New Hampshire, Pennsylvania and Wisconsin come quickly to mind — that voted Democratic the last two presidential elections but narrowly so in 2004. That has left the remaining three-fourths of the country as essentially bystanders to this year’s presidential action. It is a number that includes the huge electoral vote prizes of California (55) and New York (29), which for the past 20 years have voted solidly Democratic, as well as the growing electoral powerhouse of Texas (38), which for even longer has been the cornerstone of the Republican presidential coalition. This constricted electoral map makes sense in light of our sharply divided nation — with the two coasts strongly Democratic and much of the interior outside the battleground states of the Midwest just as avidly Republican. But it is well to remember that it has not always been this way. A half century or so ago, the map was quite fluid, with virtually the whole country up for grabs from one election to another. That was so much the case, that in his acceptance speech at the 1960 Republican National Convention, Richard Nixon promised to visit all 50 states before Election Day. In light of the times, Nixon’s pledge was not just dramatic, but made some political sense. States were not firmly locked up for one party or the other as they are today. 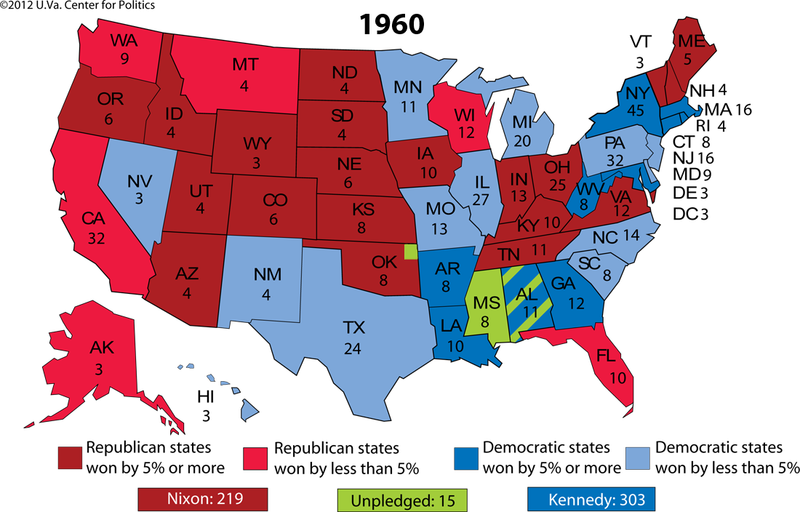 Four years earlier, Republican Dwight Eisenhower had scored a 41-state landslide. Four years later, the pendulum would swing sharply the other direction, with Democrat Lyndon Johnson winning a 44-state blowout. But in 1960, Nixon was engaged in a close contest with Democrat John F. Kennedy in which every electoral vote was valuable. Nixon ultimately fulfilled his 50-state pledge, but not without considerable exertion. He lost about 10 days of campaign time in the late summer while hospitalized for a staph infection caused by an injury to his knee. In the frenetic stretch of campaigning that followed, Nixon contracted a cold and fever. On Election Day, Nixon carried Alaska by less than two percentage points, so it is arguable that his 11th hour trip to the frozen north might have won him the state. But it came at a considerable cost elsewhere. Nixon lost most of the other closely contested states with much larger electoral vote payoffs, including Illinois, Michigan, Missouri, New Jersey, Pennsylvania and Texas. All were states where a late effort by Nixon might have made a difference. Instead, he lost decisively to Kennedy in the electoral vote, 303 to 219 (with 15 votes for Southern-based unpledged electors), to go along with an extremely narrow 49.7%-to-49.5% loss in the popular vote. 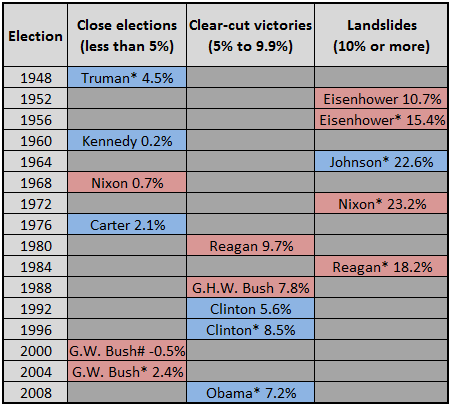 In terms of the closeness of the results at the national and state levels, the 1960 election is in a class by itself. Nine states were decided by less than two percentage points. A total of 20 were carried by less than five points. And 34 states were settled by less than 10 points — a group that possessed nearly 80% of all the electoral votes in 1960. Compare that to 2000, the closest presidential contest of this political era. It was so closely divided that it initiated talk of a “50-50” nation, a description that continues to politically define the country today. But while the race in 2000 was very tight nationally — a half-percentage point win for Democrat Al Gore in the popular vote that was trumped by Republican George W. Bush’s five-vote edge in the Electoral College — the results were much more one-sided than in 1960 at the state level. A mere six states in 2000 were decided by less than two points. Only 12 were won by less than five points. And there were just 22 states won by less than 10 percentage points — a collection that represented barely 40% of the nationwide complement of electoral votes. That basically is where we stand today — with the real prospect in November of the third presidential election in the last four to be decided in the popular vote by less than three percentage points. Yet at the same time, the vast majority of states appear firmly wrapped up for one party or the other. No presidential candidate nowadays would even consider making a pledge to visit all 50 states as Nixon did in 1960. Why bother? The electorate is more partisan and polarized than a generation ago, and so are the states. 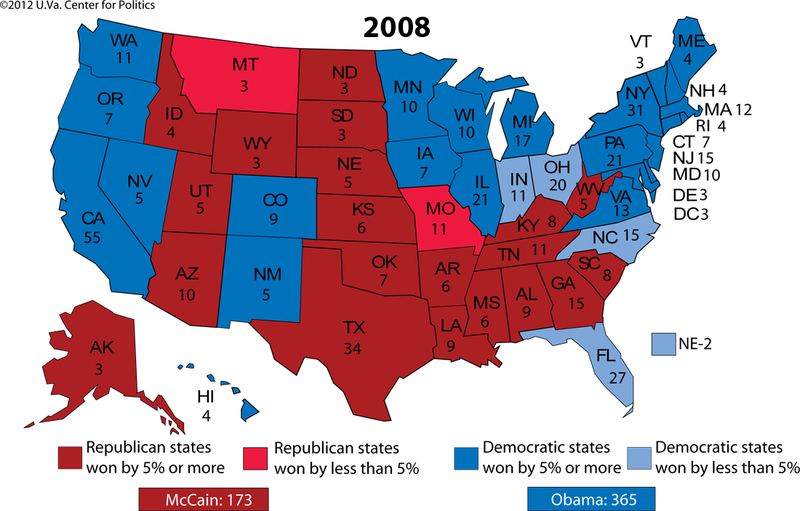 As a result, most are bit players in the 2012 campaign, where swing states numbering barely a baker’s dozen appear to have starring roles — New Hampshire and Pennsylvania in the Northeast; Florida, North Carolina and Virginia in the South; Indiana, Iowa, Michigan, Ohio and Wisconsin in the Midwest; and Colorado, Nevada and New Mexico in the West. As for the rest, their voters can watch from the sidelines…and root. Throughout most of the 20th century, many presidential elections ended in landslides. From 1904 through 1984, 12 of 21 were settled by popular vote margins of 10 percentage points or more. But times have changed. Not only have there been no such one-sided contests since Ronald Reagan easily won reelection in 1984, but two of the last three presidential elections were decided in the popular vote by less than three percentage points. Notes: An asterisk (*) indicates an incumbent. A pound sign (#) indicates that Republican George W. Bush actually lost the popular vote in the presidential election of 2000 to Democrat Al Gore. But Bush was elected by narrowly winning the electoral vote. Source: America Votes 28 (CQ Press). Over the last half century or so, the number of states that have been closely contested in presidential elections has steadily declined, while those that have voted decisively for one party or the other has dramatically increased. That is apparent when comparing two of the closest presidential elections in American history — 1960 and 2000. In Democrat John F. Kennedy’s narrow popular vote victory over Republican Richard Nixon in 1960, a total of 20 states were decided by less than five percentage points, while just 16 were won by 10 points or more. 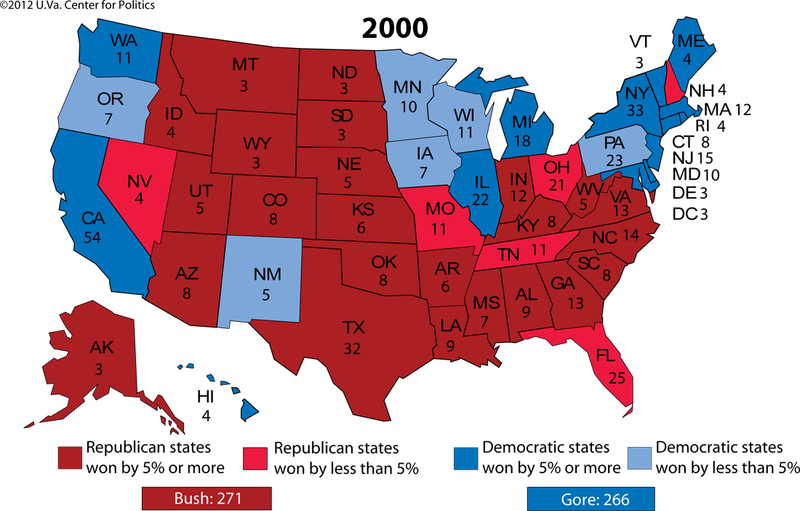 Forty years later, when Republican George W. Bush won the electoral vote over Democrat Al Gore while narrowly losing the popular vote, the competitive part of the electoral map had shrunk drastically. 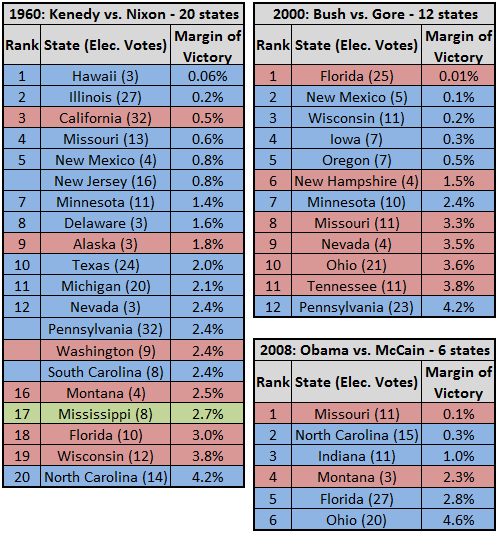 Only 12 states were settled by less than five points in 2000, while 28 were won by 10 points or more. In the not so close 2008 presidential election, the disparity between the two categories was even larger. Notes: In each election, the winner’s name is indicated in capital letters. An asterisk (*) denotes an incumbent president. George Wallace ran as the candidate of the American Independent Party in 1968, which is represented by an “(A).” The District of Columbia has been consistently won in presidential elections since 1964 by more than 10 percentage points but is not included among the total number of states. 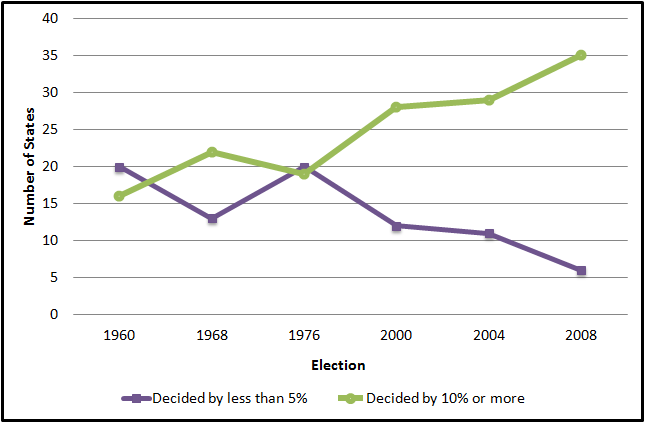 However, the District’s electoral votes are included since 1964 in the “10% and up” column in the chart. Notes: In 1960, the plurality of Mississippi’s voters chose “unpledged” as their presidential choice; all eight of the state’s electoral votes went to Harry F. Byrd. Additionally, six of Alabama’s 11 electors cast ballots for Byrd as did one of Oklahoma’s electors. In 2000, one elector from D.C. did not cast an electoral vote, leaving Al Gore with 266 rather than 267 electoral votes. Over the last generation, the competitive portion of the nation’s presidential election map has shrunk dramatically, with a number of huge electoral vote prizes moving from “in play” to firmly in the camp of the Democrats (California, Illinois, New York) or the Republicans (Texas). But “old reliables” such as Florida and Ohio remain high on the list of competitive states. Note: Mississippi is colored green in the 1960 chart because its electors were unpledged.